Niš is a town in southern Serbia, situated on the river Nišava. With 393,357 inhabitants (census of 2011), the population density is 426 residents/ km² and is the second largest city in Serbia. Niš occupies an area of ​​approximately 597km² including Niška banja and 68 suburban and rural settlements, and it is the administrative center of the Nišava Administrative District. Niš is located in the Niš basin on both sides of the river Nišava, near its confluence with the South Morava. It is surrounded by the Hum, Vinik and Kamenički vis hills in the northeast, and in the south by the Gorica and Bubanj neighborhoods. The roads leading to the Morava Valley near Niš, branch off southward to Thessaloniki and Athens, and east to Sofia and Istanbul. The strict city center is located at 194 m above sea level (at the monument in the center). The highest point of the city area is the Sokolov kamen (1,523 meters) at Suva planina, while the lowest point (173 meters) is near the village of Trupale at the mouth of the river Nišava. Throughout its long history Niš was a part of many kingdoms and states, having the role of the administrative, military and trade center and an important transport link to the Roman road Via Militaris, later called the Imperial road, that connected Europe and Asia Minor. It is the birth place of Emperor Constantine the Great, and Emperors Constantius II and Justin I. The position of Niš alone has made it strategically important and therefore an attractive city for many conquerors. Niš was under the rule of the Dardanians, Thracians, Illyrians, Greeks, Romans, Huns, Avars, Serbs and Bulgarian, Hungarian, Byzantine, Ottoman Empires. In 1878 Niš enters again into the composition of Serbia, still being under German occupation during the First and Second World War. The influence of different nations that ruled Niš can be noticed in the cultural heritage of the city, especially in its architectural diversity. Today, Niš is an important economic, academic, cultural and political center of Serbia. Airport “Constantine the Great” is an international airport with the international label INI. The University of Niš, founded in 1965, has 13 faculties and around 30,000 students. Niš is also the seat of the Niš Eparchy of the Serbian Orthodox Church. 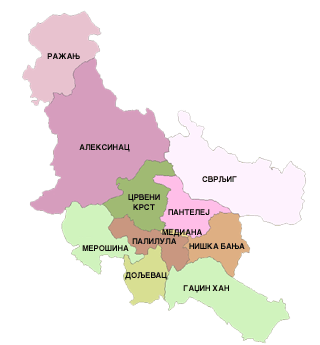 In 2004 the city was divided into five municipalities: Medijana, Red Cross, Palilula, Pantelej and Niška Banja.